For a practical introduction to writing Firetasks, see the Guide to Writing Firetasks. In general, put any flexible input data as root keys in your spec, outside the _tasks section. An example of this was the input_array parameter that defined the numbers to add in our Addition Task (see the firetask tutorial). Also put in the spec any metadata about your job that you want to query on later. You can perform rich MongoDB queries over the JSON document in the spec. Performance will be better for keys that are at the root of your spec versus nested within dicts. If you are using the duplicate check feature, also put in the spec any parameter needed to help verify that a job is truly duplicated. For example, you might provide a unique String that FireWorks can use to quickly check duplication between jobs without explicitly checking that every parameter of two jobs are the same. You can also put input data needed by your Firetasks within the _tasks section of your spec. For example, the ScriptTask we explored defined the script input parameter within the _tasks section (see the introductory tutorial). Generally, this technique makes querying on your parameters more difficult and can lead to input data repetition if you have many Firetasks that need to access the same data. However, its advantage is preventing namespace collisions between parameters used in different Firetasks or if when running the same Firetask multiple times. For example, you might have multiple ScriptTask instances in your Firework, and each needs its own distinct script rather than a global parameter. 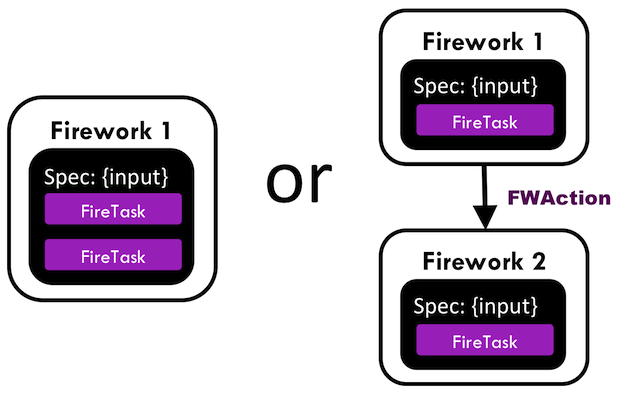 The default Firetasks built into FireWorks generally allow you to choose how you want to do things; for example, see the _use_global_spec option in the ScriptTask documentation. We saw an example of the “multi Firetask, single FW” solution in the firetask tutorial and the “single Firetask, multi FW” solution in the Creating Workflows. Which is better? In general, using fewer FireWorks is simpler to implement, but less powerful. We suggest that you start by trying to map your workload into a single Firework with multiple tasks to maximize simplicity. Then, use the following table to help decide what points of your workload would benefit from being encapsulated into its own Firework, and what parts would be cumbersome to split up. What you might notice is that the FireWorks codebase treats the “Firework” object to be the atomic computing job. Jobs are launched, tracked, restarted, and duplicate-checked at the Firework level. The Firetasks are a convenience that let you simplify some of the overhead associated with having many FireWorks, especially when you want to run many tasks in the same directory and on the same machine. However, not many features are available at the Firetask level. You’ve made it to the end of the workflows tutorial! By now you should have a good feeling for the basic operation of FireWorks and the types of automation it allows. However, it is certainly not the end of the story. Job priorities, duplicate job detection, and running through queues are just some of the features we haven’t discussed in the core tutorial. If you haven’t already set up Worker computing resources to execute your jobs, you might do that now by following the Worker tutorial. Otherwise, you might return to the home page and choose what topic to pursue next.